In 1991 Judy Fisher Oetinger, photographer Todd Buchanan and the late Lynn Weatherman, writer/historian of the American Saddlebred Association, combined their talents to produce the first pictorial book exclusively dedicated to the American Saddlebred Horse. Now almost two decades later, this timeless classic has been fully updated and republished, just in time for the World Equestrian Games to be held in Lexington, Kentucky from September 25 to October 10, 2010. 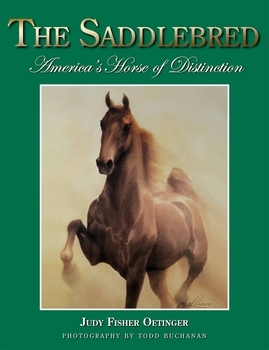 This unique volume is a beautiful combination of words and photographs that show in great detail what Saddlebreds are all about—in the show ring, on the trails, in dressage, carriage and jumping competitions, along with pleasure riding and driving, and on the farm. In addition to the dazzling photographic imagery of award-winning photographer Todd Buchanan, the book contains chapters on the history of Saddlebreds, the Foundation Sires, brief biographies of famous Saddlebreds of the past, a brief history of ASHA, and an appendix of World's Grand Champions from the Kentucky State Fair, all accompanied by historical photographs and equine art.